Date: Wednesday 11th February 2015, 8.00pm. Originally £32, a £10 reduction came from the £200K seasonal Premier League away fan fund. Referee: Andre Marriner - a third Newcastle game of the season for the West Midlands-based whistler, after a 1-0 Premier League home win over Liverpool and 0-4 reverse away to Spurs in the Capital One Cup. 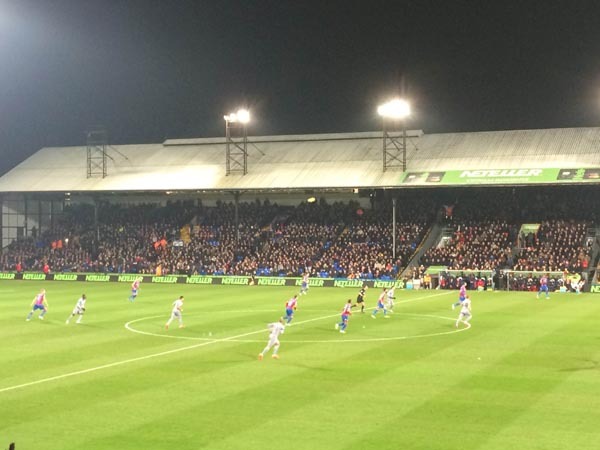 Attendance: 25,118, including 2,762 away fans. A slightly higher crowd than for last season's meeting but not a sell out. Spotted outside the Toon section turnstiles before kick-off was the club's "media management consultant" Keith Bishop - prompting wild thoughts of a return to the away end after several seasons for Mike Ashley. It rapidly transpired however that "Bish" wasn't in the company of the owner and was mistakenly attempting to gain access to the the wrong part of the ground. He was quickly redirected towards the comfy seats by a steward. PS: There was another outing for Kayla the eagle, who swoops back and forward across the pitch before kickoff. Not quite as impressive as the Benfica one but still noteworthy. Sadly though, the Eagle Heights charity who look after Kayla and many other creatures are struggling financially. With Palace apparently not making any contribution, their own online fan community have now taken it upon themselves to stump up the necessary funds. In the celebrations, Fabricio Coloccini was hit by a coin thrown from the Holmesdale End (home fans) that just missed his eye. The FA were made away from the referee report but intend to take no action. Officers in Croydon Borough are investigating coins being thrown during the Crystal Palace FC vs. Newcastle United FC match on Wednesday, 11 February. The incident was reported to police by stadium staff and occurred at around 20:45hrs after Newcastle scored. There were no reports of any injuries made to police. There have been no arrests and officers are working with the club and match officials. The investigation continues. "It's another game unbeaten. That's one win, three draws and two defeats now, which is not bad in this league. "We see how difficult it is to win games in the Premier League....this is my glass being half full. We’ve lost two games, one to the potential champions Chelsea, and one to Southampton late on, who were third at the time. "They were two difficult games. I am really positive. We have a break this weekend and I am going to give the guys a few days off. Their focus and concentration has been first class. "Everything I have asked them to do, they have done for me. You can see that a group of players who do have ability but are certainly working for the cause. “They are working for the club, the badge and the fans. That’s very important. I will give them a few days to recharge their batteries. “Let’s not forget that we did have one game less to prepare for Palace. So it does make a difference at this level. The majority of the team were the same one that played last Sunday. So I will give them a few days off. "We said before the game we knew we were up against a big physical side and the pitch was quite lively, so we knew it was going to be a bit of a battle. "I stuck Papiss Cisse in - he's a fox in the box and, if he keeps scoring, he has to be in the team. 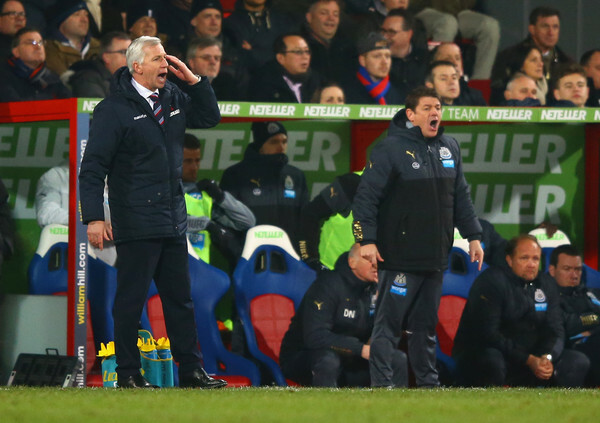 "I know for a fact that he (Pardew) got a little bit of a surprise by our team selection. I was brave from the start by sticking two strikers in the team. But it was not working for us and I needed to change the shape of the team, and I did. But when someone knows your team inside out, it is sometimes very difficult and I was expecting them to do something different. "Then he changed it and put (Jason) Puncheon into the middle of midfield and brought on an extra striker. He had quite a few strikers on at the end! And we knew he was going to put us under pressure. "It's a bit strange facing Alan Pardew because I worked with him for four years. Once I got off the bus I went into professional mode. After the game he said to me, 'Well done, you deserved the point'." "I know all about Yannick Bolasie because I worked with him every single day at Plymouth Argyle. "I was concerned that he would make another goal and we would lose, so I had to do something about it. Sometimes you have to take off your flair players to get something out of the game. "It was quite lively and I knew we weren’t going to be able to get it down and pass it." "That can't happen, can it? It's disappointing from Palace's point of view as they have an unbelievable atmosphere, and one idiot has thrown a coin. 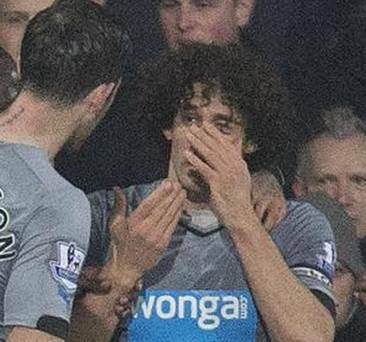 "It missed Coloccini's eye by one inch - it could have blinded him. 'You can't have that in this game. I hope the authorities deal with it, and I'm sure they will because it will be on TV every other minute and rightly so. Let's find out who it was and sort it out." "Every point is like gold-dust in the Premier League. It’s difficult because Newcastle defended really well and made it difficult for us. They scored with their only shot on target and put us on back foot. "I was really pleased with our reaction in the second half, we took the game to Newcastle, took a few chances, but it was the bench that salvaged the game for us. Yannick’s cross was of the highest order. "He had no right to put a ball of that quality in with the room he had and it was a great goal for us and gave us time to try to get the winner. There was only going to be one winner at that point but we just couldn’t force the goal and Tim Krul made a great save from Brede (Hangeland). "The way Newcastle applied themselves and defended they probably deserved their point. "He’s an exciting player (Bolasie), he has great power and technique and he gives you unpredictability in your team which I quite like. We’re not perfect, at times tonight we were running out of ideas so we need to nail down our style a little bit better but I thought we controlled possession much better than we normally do at home and we’re getting better. "The two goals were top drawer but there probably wasn’t enough top drawer play tonight particularly from the offensive players on show because there were opportunities to get a second and third goal tonight. "I’m enjoying myself here, it was a great reception from the fans, and they were brilliant again tonight. Hopefully we can give them a result on Saturday in the cup which will be a great occasion. The most important thing was another point tonight. "We must never get away from the fact that we have a battle on our hands and it’s hotting up down there. Everyone is looking at the finishing line because it is not far away so you have to be right in every game." Tonight's fixture is obviously very special for me as I am pleased to welcome my good friend John Carver and a team of players that are still close to my heart after my four years as Newcastle manager. Much was muttered and written during my time in the north-east, and as this is the first chance I have had to talk directly to the Newcastle supporters and the players who worked so hard for me since my departure, it is a great opportunity to reflect on a period that was much-discussed and often unfairly judged in my opinion. Southampton's push for a top four finish is probably the only comparable story in recent years. If you look at the net spend we had in my time at Newcastle on transfers, you can only conclude it was a successful period because the club I left are established in the Premier League with a platform to go on to the next level. It is a legacy that I am proud to have on my record. I miss so many people at Newcastle, especially my wonderful staff who were so loyal and committed to me and the club throughout my time in the north-east, which isn't always easy when the tide of popular opinion has turned against you. It will be especially pleasing to meet up with my friend John Carver again tonight and I'm delighted he has been given the chance to take my place at Newcastle until the end of the season. Any Newcastle supporter who doubted my devotion to their club cannot have any such reservations about John. Here is a man who lives and breathes Newcastle United through all the cracks on his face and I'm sure they will multiply over the next few months now that he is experiencing the pressures of being manager of the club. We had some fantastic players at Newcastle during my time there; the captain Fabricio Coloccini, Yohan Cabaye, Moussa Sissoko, Demba Ba, Mathieu Debuchy, Tim Krul and Cheick Tiote are among those who gave so much to my time at the club and as I see the Newcastle players coming to face my Palace team tonight it will be emotional for me and my family. (Despite scoring the goals that took United to fifth, Papiss Cisse doesn't warrant a mention, while the fact that no British players are name-checked is more a reflection of the club than the manager. Despite all the negativity that was generated around my presence at Newcastle at times, I was proud and honoured to manage the club and while the three points I'm desperate to collect as Palace manager are all-important, nothing will ever dilute the affinity and affection I will always hold for the club who are in opposition tonight. To all wearing the black and white shirts I wish you well - just not tonight OK! Midfielder Jack Colback's ninth yellow card of the season leaves him just one booking away from an automatic two game ban. Almost inevitably, the meeting of Alan Pardew's present and former clubs on Wednesday night ended all square, with neither side able to seize the initiative and both ultimately content with a share of the points. United did began with a more positive formation than on Sunday as Papiss Cisse joined Ayoze Perez up front and the Senegalese striker headed headed home his tenth goal of the season to give his side the lead at half time. However, that proved to be a rare moment of action for the away contingent to cheer at Selhurst Park, as the home side levelled and then went in search of a winner - Newcastle content to soak up pressure and stretch their unbeaten record against Palace to 11 games. And disappointment that John Carver's side managed to create even fewer scoring opportunities than in the 1-1 draw with Stoke was mirrored in defence as possession was again surrendered cheaply and a simple cross into the box was turned home by an unmarked opponent. If there was a positive from tonight - apart from avoiding defeat and denying Pardew a chance to strut and crow - it was that their equaliser came well ahead of the full time whistle and was both inevitable and deserved. With Shola Ameobi absent from the Palace squad, the first meeting of Pardew and United was more of a media event than an occasion for either support or derision, the posse of pitchside photographers present more high profile than any great crowd gesture or reaction. Noisy home followers indulged their new gaffer with supportive chants, while Pardew's former fans responded with that old favourite "it's never your fault"closely followed by, "you're full of sh*t."
Some defensively-minded substitutions from Carver meanwhile prompted a late burst of "are you Pardew in disguise?" The answer to that is of course, yes...but like the match, there was a sense that those present in the away sections were going through the motions; a bit low-key and passionless - and a country mile away from the bile and vitriol at SJP against Cardiff last May. A first half of little goalmouth action had seen Fraizer Campbell put the ball in the net on 36 minutes, but he had been correctly flagged offside. 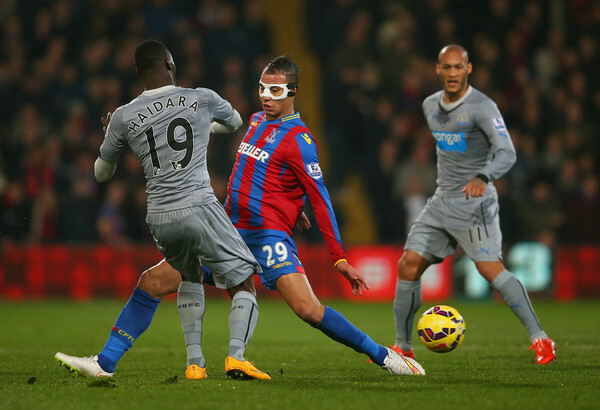 Cisse then marked his first club start of 2015 by reaching double figures for the season with a well-judged header from a rare United attack - one in the eye for Pardew, who failed to name check the man from Senegal in his career review (see above). Pardew brought on Yannick Bolasie halfway through the second period and he made an instant impact by setting up former mackem Campbell to slide the ball past Krul. What momentum there was from then lay firmly with the home side, but their attacking attempts also lacked fluidity - Zaha demonstrating the form that saw him laughed out of Old Trafford and back to south London. Despite both conceding, neither goalkeeper was truly tested until the 88th minute when Krul pulled off a spectacular one-handed block to deny Brede Hangeland and the game wound down to a conclusion with little else to raise the temperatures. Perez was again left to fight a lonely battle for the scraps of whatever came his way while Remy Cabella spent much of the night on his derriere in the mostly vain hope of winning free kicks. Having scored the only goals of his Magpies career here earlier in the season, Emmanuel Riviere was trusted for the final seconds of normal time and three added minutes. Only marginally more useful than phantom striker Facundo Ferreyra, serious questions need to be asked about Riviere's fitness, attitude and suitability - especially in a squad that's subject to our 'downsizing' mindset. Justifying the absence of Perez from the Leicester City cup loss because he'd "ran out of fuel" after playing against Burnley a couple of days earlier, there were no such utterances from Carver after this one. We're not quite at the point of exploiting the Spaniard like Dalglish did with Tomasson back in 1997, but Perez is showing some signs of burnout and the free weekend is a boost for him. The point took United on to 32 points and left them 11th in the table - five points and three places worse off than at the same point last season. John Carver's side sit five points clear of Palace and Everton and ten points clear of the bottom three. He may be content with that - as he was to have his squad reduced in January while most of the rest of the league was expanding theirs - but six points from six games (and just one clean sheet) since Pardew abdicated is a long way short of inspiring, especially looking at our remaining games. Staying unbeaten in three games since he was confirmed as being in nominal charge until the end of the season may count as "going on a run" in Carver's own analysis, but to many others it looks more like we're beginning to drift off in the style of last season. That goal of eighth looks less likely. And while the news on Siem De Jong is a blow, it's hardly unexpected given his fitness record when younger and playing in less full-throttle and abrasive league. Carver may have pledged not to question the club's recruitment and selection policy, but those paying to watch it are entitled to - even if it was at a discounted rate.